A reportage of the rooftop swimming pool action can be found at the web-site of the neighbourhood council (Wijkcentrum d’Oude Stadt)…..
All this to make you understand the action for taking a dip in the rooftop pool by the locals – an initiative of the ‘Rolkoffergroep‘ (rolling case/trolley group, named after the irritating sound of tourists with suitcases on small wheel banging over the inner town streets) – on August the 8th.. 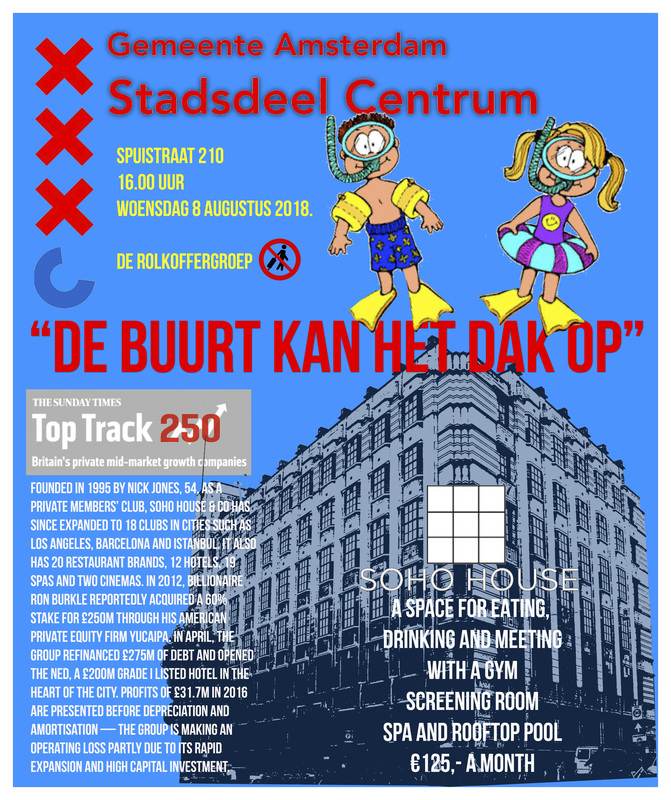 Especially the issue of a swimming pool in the old inner town has its own sad history, as there has been a public one at the Heiligeweg (not far from the new exclusive one at the Soho House), that existed for 91 years (1896-1987). Inner town inhabitants did form a committee in the eighties of last century to keep the swimming pool from closing because of budget cuts by the then social-democrat city government. They even did manage themselves this public swimming pole for several years. Seeing an exclusive club swimming pool getting a municipal permit 30 years later did remind many of us the loss of social common facilities in a town with a local government that often claims to be social progressive, which is a deep lie. “ Feast your eyes on the first shots of the stylish new spot” was the comment of the HighSNOBiety web-site commentator on the interior of Soho House Amsterdam, which amounts up to nothing more than a ‘non-style’, a smug bric-à-brac of recycled furniture sold under the common-donominator of ‘vintage’ or ‘retro’, a concept that may perfectly fit the ‘retarded’ minds of those who want to spend one and a half thousand euros a year for the ‘mediocre exclusiveness’ of the Soho House enterprise. Already in 2016 there was this comment on the so called ‘exclusivity of Soho House in The Guardian (click the ‘The Guardian” for direct link; link underline is not well visible): “York said: “The whole point of private members’ clubs is that exclusivity, that they are where the magic people will all gather. Soho House is a very efficient operation, but there is one at every turn now, and they have diluted their brand to, I think, their detriment. 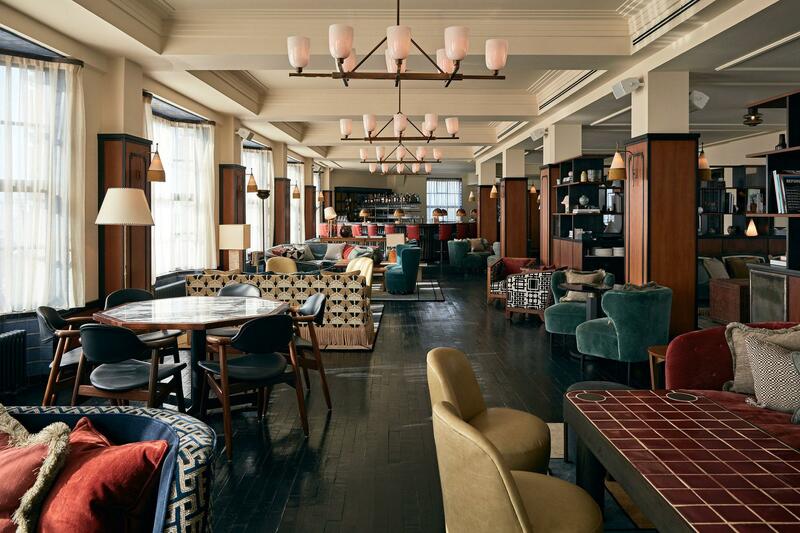 Soho House has attempted to maintain its appeal to artists and creatives, offering discounts for those under 27, and the only condition of joining is that people have a “creative soul”. Five years ago, it culled hundreds of members from it branch in New York, whom it deemed “too corporate”.